It’s not a Dirty Harry film… But someone forgot to tell Clint Eastwood. Clint Eastwood carries around so much Legend with him that no matter how he approaches a character, we view him through the prism of his inimitable Avenger archetypes. He was Dirty Harry in only five of his nearly 60 starring films (DIRTY HARRY, MAGNUM FORCE, THE ENFORCER, SUDDEN IMPACT, and THE DEAD POOL) yet when Clint goes Avenger, no matter his character name – from TIGHTROPE to IN THE LINE OF FIRE – he’ll always be Harry Callahan to us. So it’s hard to be objective about GRAN TORINO. Foul-mouthed Walt Kowalski (Eastwood) is an outspoken racist who demeans religion, drinks and smokes, estranges himself from his children and grandchildren, mocks foreign families, and pulls a rifle on a boy who tries to steal his car. Only Clint could play this 78-year-old, unrepentant Korean War vet and still be loved for it. No one else could have pulled it off – after all, a man’s got to know his limitations. Recently widowed Kowalski is the last white man standing in a Detroit neighborhood overrun by Hmong immigrant families from Southeast Asia and Vietnam. He is none too happy with his social situation – in fact, he acts the hell out of the Actor’s Workshop definitions of Cantankerous and Surly – and keeps busy by obsessively mowing his lawn (seemingly subsisting on nothing but beef jerky and beer) and fawning over his prized 1972 Gran Torino (“put the engine block in myself”). A local gang forces Kowalski’s young neighbor, Thao (Bee Vang), to “mess with another man’s vehicles” and steal the Gran Torino as initiation, but Thao comes up against Kowalski’s aforementioned rifle and flees. The next night when the gang returns for the unwilling Thao, a scuffle breaks out and ends up on Kowalski’s well-tended lawn. In the history of this icon’s menacing, clenched-teeth deliveries, that has got to be one of the most hilarious. Because that is the moment Walt/Clint/Philo becomes Dirty Harry. And for once, we cheer the grumpy old man. That’s why no one else could have played this role. When someone offends a character played by Clint, we expect Clint to pull a gun. It’s as natural for him as pulling out his keys. Anything less would detract from his Avenger awesomeness. Now if Woody Allen played Kowalski, we’d have a more believable “Everyman pushed to the edge.” Clint is hardly Everyman. And you don’t have to push him to the edge to get a gun in your face – the middle will do. That’s what keeps Clint Harry. While the Hmong neighborhood showers Kowalski with gifts for his “heroism,” the gang harbors a vendetta against Thao’s family, which only escalates. Meanwhile, Thao offers his services to Kowalski to atone for his attempted theft; thus even as events concatenate to bring out the Callahan in Kowalski, his paternal side is awakened as he mentors Thao. As Kowalski’s own doughy W.A.S.P. sons and their shiftless children grow more distant every day, Kowalski forms a begrudging bond with Thao and elder sister, Sue (Ahney Her), who brings Kowalski out of his provincial shell, showing him the world beyond American borders – just over the other side of his lawn. Clint’s performance, though not Oscar-worthy, is vintage Clint, all sneering one-liners and avenger glares, recognizing his own star quality and humor and playing to those strengths. He even croaks the outro song. Because he can. Because he’s Clint. The cast of unknowns supporting him is another matter. All the Asians (except for Ahney Her and Doua Moua as the gang leader) cannot act and seem like props for the story to progress. In his first film role, Bee Vang does such a useless job as Thao that we’re constantly wondering whether he’s acting socially inept or whether his acting is inept. When you “fall out” of the film to wonder – Game Over. This man has tongue-kissed Death, garnering war medals he has no use – and even less respect – for; we feel his visceral absence of fear against tiresome street punks who think they are tough because their pants are low. 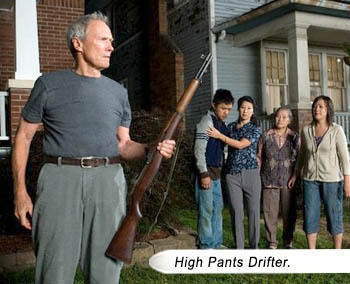 Eastwood shows us it has nothing to do with height of pants, as his are up somewhere near his armpits. The pants are a dead giveaway – we realize with a sudden impact this man is a “grandpa.” It takes a bit of getting used to hearing his actual grandkids say it, rather than a bad guy mocking him before getting the subsequent knuckle sandwich or magnum opus. 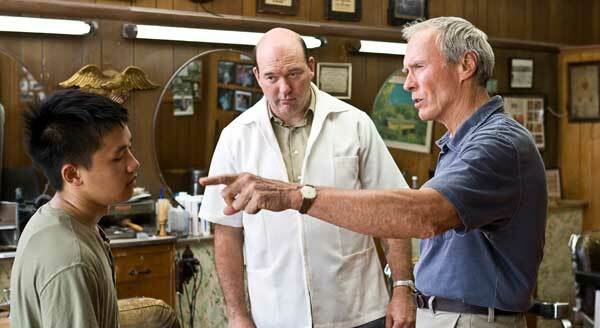 Unflinching vigilantism: a staple of all Eastwood’s avenger films – GRAN TORINO, no exception. Whether Clint endorses it or not, judging by the audience cheers when Kowalski breaks the face of a gangbanger with his fists, I’d say we all know the difference between The Law and Justice, and that vigilantes do have their place in a world gone wimp. So we feel the inevitable coming: Screenwriter Protocol decrees the Curmudgeon must soften and the Patsy must harden (i.e. racist Kowalski learns tolerance and wimpy Thao learns manliness – they “complete” each other) – but it doesn’t come! Taking their cue from that rubber bracelet, “What Would Harry Do?” director Eastwood and writers Nick Schenk and Dave Johannson allow Kowalski to become a hero without becoming insufferably pc. Yet another Eastwood film that defines “heroism” clearly: A hero is someone who has the option NOT to be. Eastwood has claimed GRAN TORINO is his acting swansong, which is a tragedy for over four generations of boys who became men on his avenger characters. Perhaps this story’s conclusion is so stark because he finally, decisively, wants to put the specter of Harry to rest. That might be hard to do after 37 years, punk. In LIVE FREE OR DIE HARD, I called Bruce Willis the screen’s Last Action Hero. I was wrong. There’s always gonna be some Dirty left in our Harry. Writers: Dave Johannson, Nick Schenk. Starring: Clint Eastwood, Christopher Carley, Bee Vang, Ahney Her, Brian Haley, Geraldine Hughes, Dreama Walker, Brian Howe, John Carroll Lynch, William Hill, Brooke Chia Thao, Doua Moua, Chee Thao, Choua Kue, Scott Eastwood.